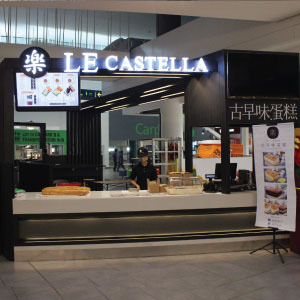 Le Castella, the Taiwanese brand sponge cakes has opened its doors at gateway@klia2 now. Using specially imported ingredients from Taiwan, the cakes are freshly baked in giant ovens onsite daily and served steaming hot. The pillow-sized cakes, which take an hour to bake each, are wheeled out of the kitchen every 15 minutes, flipped, stamped with the brand's logo and cut up into blocks using a measuring ruler. There are three flavours available here: Original, Cheese and Chocolate and Cream. Our cakes are regularly baked in-store every day, so our customers can experience piping hot, jiggly, and airy cakes.